When your kidneys hurt, it's often a sign that something definitely is wrong that requires treatment. Kidneys, unlike some other organs, usually do not cause pain unless something rather serious is wrong with one or both of them. Sometimes, when a person is convinced their kidneys hurt, something other than the kidneys are the source of the pain, which just happens to be felt in the general area of a kidney. What Kidney Pain Is Like - If there are two things one needs to be aware of with respect to kidney pain, one is that the pain is usually felt in the lower back if the kidney itself is the source. The second thing is, if the kidneys hurt, the pain will almost always be sharp and severe. 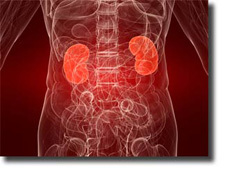 Kidney disorders seldom manifest themselves by causing dull pain. Also, if a kidney is involved, the pain will normally be felt on one side of the back only, as both kidneys are seldom apt to be involved at the same time. If the pain in the area of the kidney is a dull pain, the problem lies somewhere other than in the kidney itself. If the kidneys hurt and the pain is sharp, and the kidney is involved, body aches and a fever will often accompany the pain. A Few Causes Of Pain - An obvious cause of kidney pain is damage due to an injury of the kidney. An injured kidney will normally cause pain in the lower abdomen and possibly blood in the urine. Any time a kidney is injured or there is a suspicion that is the case, it constitutes an emergency and immediate treatment should be sought. Most kidney problems are due to diseases or other disorders and are usually slower to develop. When the kidneys hurt it often is the result of a kidney infection of one type or another. Polycystic kidney disease will result in pain as will the condition known as hydronephrosis, which is swelling of the kidney due to an obstruction of urine flow through the urinary tract. A urinary tract infection, though not an infection in the kidney itself, can cause pain in the kidneys as can kidney stones. Kidney stone pain is really not an example of kidney pain however. The stones have already left the kidney, and it is in urinary tract where the pain is felt. Horse Shoe Kidneys And Other Causes - A rare disorder which can make kidneys hurt is a condition known as a horseshoe kidney. This is a genetic condition where the two kidneys have joined together before birth, and form a single horseshoe-shaped organ. A horseshoe kidney may or may not cause problems in later life, but if it does, kidney pain can be a symptom that the disorder needs to be dealt with. Arteriosclerosis, atherosclerosis of the renal artery, or hemorrhaging within the kidney are additional causes of kidney pain. These disorders are relatively uncommon, though if any of them occurs, the pain will usually be sudden and sharp. Even in the case of kidney cancer, which may be slow to develop, when the kidneys hurt the pain will be sharp and not dull, as one might initially suspect. Kidney cancer is fortunately not very common. When it is present, it is more often than not the pressure of a tumor pressing against nerve endings that is the cause of the pain. Looking at what makes kidneys hurt, the conclusion is that most of the causes are due to something serious, and kidney pain should never be ignored in the hopes that it will go away. The pain, and the cause of the pain, will likely only get worse, and the situation could rapidly develop into something serious and even life threatening. When kidneys hurt, seek medical attention promptly.